A fantastic addition to any room, this beautiful wall sconce features a classic design with metalwork finished in brushed nickel and a stylish white glass shade. Rich satin nickel plating frames a curved rectangle of blown glass in this sleek modern collection. Offering subtle yet effective illumination, Masako displays well in a variety of contemporary dicor. Add radiance to your home with Hampton Bays Wave One Light Wall Sconce. Featuring sleek lines complemented by satin nickel finish, this fixture will add a modern touch to any dicor. With an elegant and curvaceous frosted glass shade, this vanity light will immerse your bedroom, bathroom or hallways in a warm, welcoming glow. For those looking for an added sparkle in their homes, Allaire provides a casual luxe feel to any dicor. Alternating oval and round vintage beads create beautiful strands that are completed by a large faceted glass pendalog. Champagne candles and an Antique Bronze finish add to the sophisticated design details. Two shade styles, both featuring a rich Espresso trim, are available as accessories. 1 Light Wall Sconce In Brushed Nickel A fantastic addition to any room, this beautiful wall sconce features a classic design with metalwork finished in brushed nickel and a stylish white glass shade. 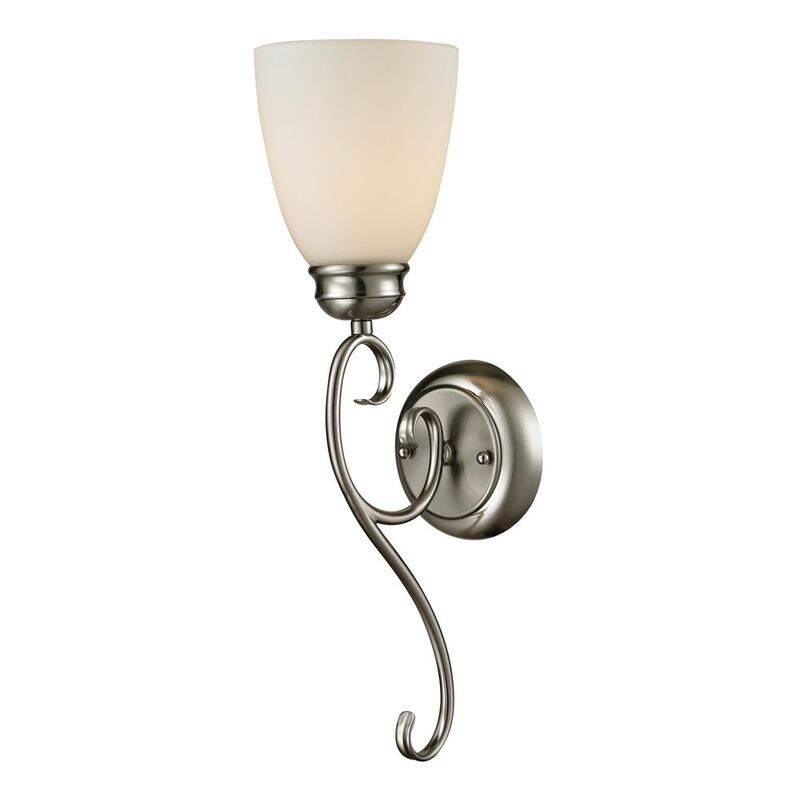 1 Light Wall Sconce In Brushed Nickel is rated 3.0 out of 5 by 1.